Termite Treatment Options - Yes Pest Pros, Inc. Termite Treatment Options - Yes Pest Pros, Inc.
Termite activity can devastate a home. South Bend termite control professionals have seen serious damage done by these insects. They can render a home unsafe and unlivable in a remarkably short span of time. It’s crucial that homeowners protect their largest single investment by regularly treating their homes for termites. 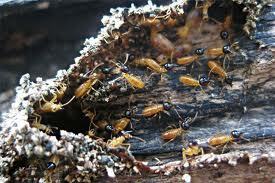 Termites are subterranean social insects that live in colonies and eat cellulose (wood fibers). They build tunnels to use as “highways” to travel from place to place. They are small and look a little like whitish ants but are only distantly related to the ant. Cellulose, their food source, is found in wood, paper and cotton which are all common materials found in the home. Finding out that your home has termites is a nerve-wracking experience. It’s important to keep a clear head and understand your options when your Bloomington pest control company tells you the bad news. Termites are not necessarily a death sentence for your home. There are treatment options for dealing with termites. Homeowners should have a good understanding of what they and their pest control company can do to get rid of these wood-eating pests. Here are just a few of the choices your pest extermination expert might set before you. One of the first things that a South Bend pest control company might suggest is to correct the conditions that made your home a target for termites. This could include re-grading the property so that water drains away from the foundation. It might also mean removing construction materials and relocating wood piles. He will help you isolate and correct the factors that encouraged termites to invade your home. There is no question that the termites infesting you home must be exterminated. They cannot be trapped or relocated. Chemical means are the most effective method for ridding your home of these damaging pests. Chemical barriers and baits are typically employed by pest control agents. Baits are placed in the home and taken by worker termites back to the nest where they are fed to other colony members, including the queen. This destroys the colony. Barriers are sprayed around the home to keep termites from coming in at all. Ask your pest exterminator to go over all you options with you and explain the benefits and risks of each one. You should feel comfortable asking questions and be confident in the answers you receive. Once you know what can be done, termite treatment doesn’t have to be so scary.